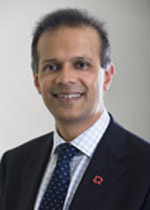 Ajay Shah is British Heart Foundation Professor of Cardiology, James Black Professor of Medicine, and Director of the Cardiovascular Division at Kings College London and Kings Health Partners AHSC. He is also the Director of the Kings British Heart Foundation Centre of Research Excellence, one of the 2 largest such centres in the UK. He is a graduate of the University of Wales College of Medicine and trained in Cardiology in Cardiff, Wales. He undertook his doctoral and postdoctoral research training in the labs of Andrew Henderson (Wales), Dirk Brutsaert (Belgium) and Edward Lakatta (NIH, Baltimore). He was a BHF Intermediate Fellow and then a UK Medical Research Council Senior Clinical Research Fellow prior to his appointment to the Chair at Kings in 1998. Professor Shahs main research interests include the pathophysiology of cardiac hypertrophy, LV remodelling and heart failure, and the mechanisms underlying vascular endothelial dysfunction, with a focus on the roles of reactive oxygen species, NADPH oxidases and NO. He has published over 200 peer-reviewed scientific articles and serves on the Editorial Boards of several scientific journals. He is Associate Editor of the American Journal of Physiology (Heart & Circulation). He remains an active practicing cardiologist with interests in interventional cardiology, heart failure and complications of sickle cell disease. He is a Fellow of the UK Academy of Medical Sciences, the European Society of Cardiology, the American Heart Association, and the International Society for Heart Research, and past-Chair of the European Society of Cardiology Heart Failure Association Basic Sciences section.